Commissions and letting the collector pick what they want. A lot of artists don't like to do commissions, but I'm not one of them. Every commission I've done has given me an opportunity to grow as an artist. My collectors have presented new challenges for me to meet and I'm always excited and encouraged with the results. Take this painting for example. 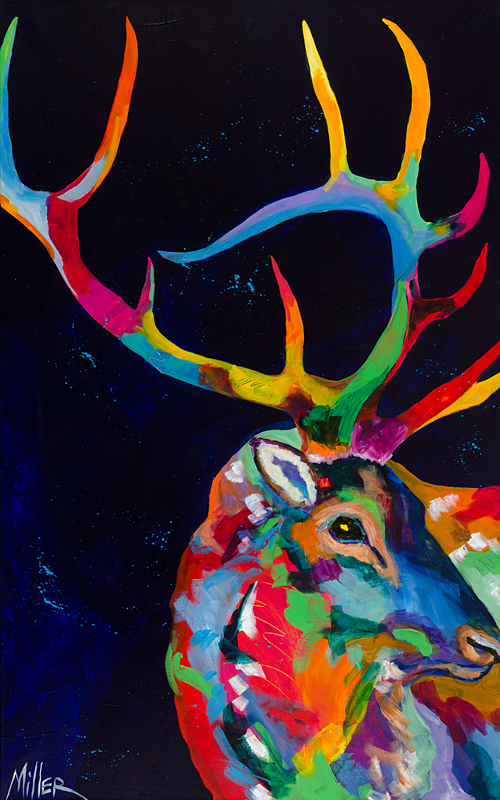 A collector came in my gallery and fell in love with a painting of an elk titled Evening Sounds. Unfortunately the size of that one was all wrong. After going home and measuring her wall, she called me back and asked if I could"re-create" that elk pose into a more stretched out version. I said yes and took the opportunity to include much more of the elk's rack giving it a really dramatic look. The customer was thrilled with the end result! I'm now doing another commission where a collector really liked a certain buffalo painting, but needs a very specific custom size. I'm reworking the placement and including a bit more view of the animal and changing the background color behind it. Be open to commissions because you never know how they will help you grow as an artist. Re: Commissions and letting the collector pick what they want. Nice job on that commission. Congratulations on that, as well as on the new BLOG.